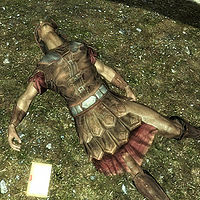 Alethius is a deceased Imperial whose corpse can be found just before the entrance to Nchuand-Zel, within the Nchuand-Zel Excavation Site underneath Understone Keep in Markarth. He wears a full set of Imperial armor, and carries a note that begins the quest The Lost Expedition. He was assigned to guard the research expedition into Nchuand-Zel, but met his untimely death, likely by Nimhe, the giant frostbite spider guarding the entrance to Nchuand-Zel, whose lair is just above Alethius's body. His note is written to someone named Salonia, and two NPCs with that first name exist in Skyrim. However, neither of them appear to have any connection to him. This page was last modified on 26 January 2016, at 22:38.